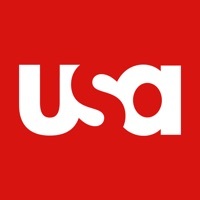 The USA app is the best place to catch up on the most recent season of your favorite USA shows, watch live TV, and stream on the go! Download the USA app now to watch full episodes of Suits, Mr. Robot, Chrisley Knows Best, The Sinner, WWE, AND MANY MORE! USA Network and SYFY are the new home of the Harry Potter franchise! You’ll find all the great content in the “Wizarding Word” folder within the app. If you don’t see the films in the USA app, check out the SYFY app! We’ll be sharing the movies between the two apps to bring the content to as many people as possible. Get started by signing in with your TV subscription (cable, satellite or digital). 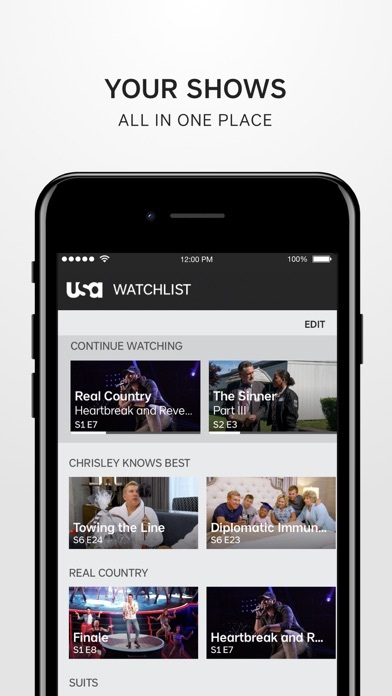 The USA app supports most TV providers, including DirecTV, Spectrum, Xfinity, Dish, and AT&T. If you do not have a pay TV subscription you can still watch up to 3 full episodes of your choice for one month. 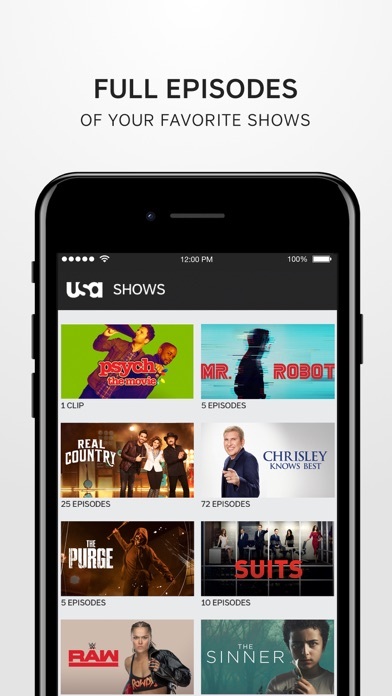 APP FEATURES: • Sign in with your TV subscription to watch full episodes of your favorite USA shows. • Don't have a TV subscription? Watch up to 3 full episodes of your choice for one month without signing in. • Stream new episodes live from within the app! • Chromecast and AirPlay compatible! 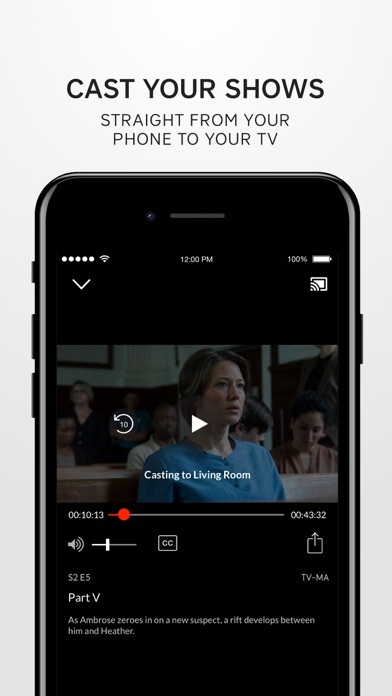 Start episodes in the app and stream to your TV. • Can't finish an episode in one sitting? 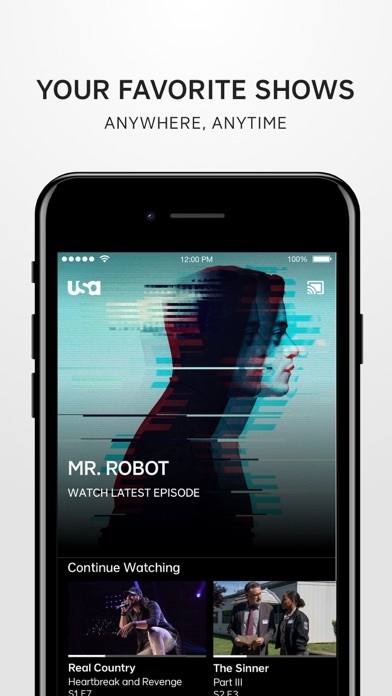 The app saves your place so you can resume watching later! • Save your favorite shows to your Watchlist for quick access to the latest episodes. COMMENTS OR QUESTIONS? Please reach out to [email protected] for assistance. Like what you see? Check out NBCUniversal’s other streaming apps, including NBC, SYFY, NBC Sports, E!, Bravo, CNBC, Oxygen, Universal Kids, Telemundo, and UNIVERSO. * This app features Nielsen proprietary measurement software which will allow you to contribute to market research, like Nielsen's TV Ratings. * To learn more about our digital measurement products and your choices in regard to them, please visit http://www.nielsen.com/digitalprivacy for more information. I love watching law and order SVU and now I can watch it on my phone whenever. Sheesh. Can’t connect to Chromecast? It’s 2019. Nothing is working. The screen just freeze up when you click on movie to watch. Tried to watch a movie on the USA Apple TV app. LITERALLY nothing happens. Click on the title, screen flashes, then takes you back to the same page to click on the title. Realized their Apple TV app just doesn’t work at all but thought maybe I can use the app on my phone and air stream it to the Apple TV. Surely their phone app has to be better. Opened phone app... just a black screen. Nothing to click on, no way to try and troubleshoot, nothing. I know that it takes time to create an app, so why waist some programmers time creating the basis for an app and then have it do nothing. It blows my mind! Application won’t let me sign in to my provider to watch show. Every time I click ‘sign in’ nothing happens. I have been having this problem for weeks. I am not able to watch my favorite shows, nor cast them via Chromecast. VERY frustrating. It won’t let me sign into tv provided so basically useless app.. I use an IPad for this app. I never have any issues with it. I only wish they had more shows on the app. Since I have an old IPad I cannot use, Fox, CBS or TNT. Although most are related they require a higher IOS than I have. I refuse to pay for upgrades if I cannot use the app. Also, on NBC I cannot watch streaming events, just old shows and limited free access. I am a senior citizen and remember when TV was free. Now it costs more than I can afford, so I really enjoy this app. Please bring more shows to the app, I would really be excited to see more newer shows. 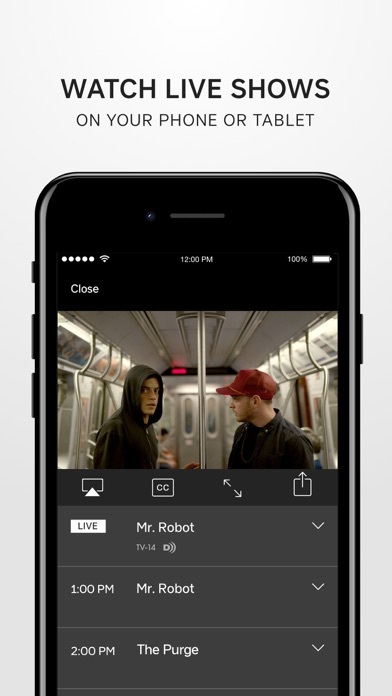 This app is complete garbage when it comes to streaming live TV. Monday Night Raw is almost unwatchable live. It always skips, buffers, and we can’t ever get it to connect to our tv or our Apple TV unless you do screen mirroring and even half the time that crashes the app. I’d rather wait a day to watch Raw on Hulu than attempt to watch it live. I have been searching all over websites just to find one show, The Miz and Mrs! I finally get to watch it on the app FOR FREE! You don’t have to pay ANYTHING! Also if you want to watch a show and you can’t, all you have to do is connect to your TV provider! I 100% RECOMMENDED THIS APP! The commercials don’t sync to when they are suppose to come on. I’m also getting Spanish commercials mixed with English ones. How much of the show you are trying to watch actually gets cut out? It seems like for WWE, some of raw and smackdown get cut out. App works good when using within iOS. I, however, prefer to watch on a tv and the live feed always freezes when casting to Chromecast. smh, going into full horizontal view NEVER works. zero stars. Honestly, why is this the only TV channel app where I can’t turn off closed captioning? Tried to download to catch up on a couple shows and ended up not being able to watch. I’d constantly get an “error message” pop up. I even attempted to restart the app/my phone. Still nothing. Not worth it! App preforms wonderfully cable went out and only had my phone but I still watched all the shows I wanted trouble free. Real life saver. Whenever you’re trying to watch a video it sometimes won’t allow you to flip the screen so it will be sideways. This is extremely irritating as you’ll have to watch the videos at a super small size. It can become very annoying when you constantly have to exit the app to get it to flip. I came to a point where I tapped the expand button several times, exited the app several times, deleted and redownloaded the app, restarted my phone and it still would not work. How can this big of a company have such a poor quality iPhone app? Buttons are usually unresponsive, the app continuously freezes, crashes, horrible navigation, once I actually get it working, I’m afraid to hit pause because it’ll never unfreeze. Try harder, do better. 90% of the time when going back into this app to watch my shows it asks me to log in or sign up for the 3 day pass. I hit log in and nothing happens. The log in screen never comes up. It’s sad that this app can’t keep up with a lot of the functionality of other network apps. This is the only one I have this issue with. Video player blows. After commercials often skips ahead. Half the time the screen wont turn sideways & the full screen button doesn’t work but all other tabs do. Sometimes commercial will start randomly on the middle of a scene. The nice thing is keep using different emails that 3 episode pass turns into unlimited. Good shows, bad app. USA Network should just put more shows on reputable streaming services & ditch the app attempt. The app logged me out of my tv provider and will not allow me to log back in. As of right now I’m kinda hating this! I have been waiting for ever to find a place where I can watch every Harry Potter movie for free so I was very excited to see that USA had them. I got logged in and everything, the movie was about to start then it says I was unauthorized! I don’t understand I followed what it said to do to fix this and it didn’t work! I’m very upset!!! Could this get fixed please because apparently I’m not the only one having authorized problems! This app is absolute trash - both on the iPhone and on the Amazon Fire Box. It skips around, buffers constantly, SD quality videos, and ADS! Also, when you pause a video, it takes you all the way back to the main screen so you have to go back into the video to continue watching. It will tell you 1 of 4 ads that you will watch sometimes 3 times each before going back to your show. I just paused mid-movie and it took me all the way back to my Amazon Fire Box screen. NBC, you aren’t poor, stop creating apps like you are. Almost every show I try to watch begins skipping ahead by several seconds or even minutes multiple times causing me to miss portions of the show. To make it worse, it is usually in the final ten minutes of the show when the storyline is being wrapped up or the problems are being solved. Soooo disappointing to have such lousy service from such a big company! Just downloaded today. Tried to sign in to my provider but nothing happens. Deleted and re-downloaded three times, still nothing. Junk app. Cannot sign in or even select a provider. You have to have a subscription to watch anything. I just downloaded this app to watch “Temptation Island” and it does not even cast to my tv. I sat here for 10 minutes refreshing the app, turning off my tv and it just doesn’t play the episode no matter what I try. This is really frustrating. Hard to get it to accept login then says you are not authorized. The season of the show I am into has stopped at episode 3 for months. The 4th apisofe came out in August so why is that? No good. Love ❤️ that I can catchup on my shows without going to on demand or dvr. I’ve been using the app for about a month now and haven’t had any issues so far not sure what all the complaints are about but haven’t had any issues on my end. Oh, it logs me out every time I close the app. It’s a pain. Why even have an app that does nothing but crash. Also, god forbid you actually upload programming to the app, for crying out loud. There is barely any programming on here. God forbid.